Here are a few things we asked this week that we can never unask. 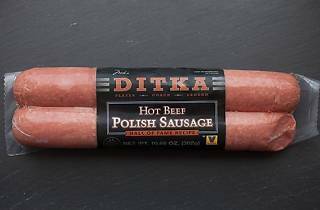 At the Cell: "Do you have Mike Ditka's sausage?" At America's Dog: "I know you're supposed to carry Mike Ditka's beef sausage, but is it on the menu?" We learned our lesson by Jewel, and phrased things differently: "Do you carry the Vienna Beef sausage that Mike Ditka made?" 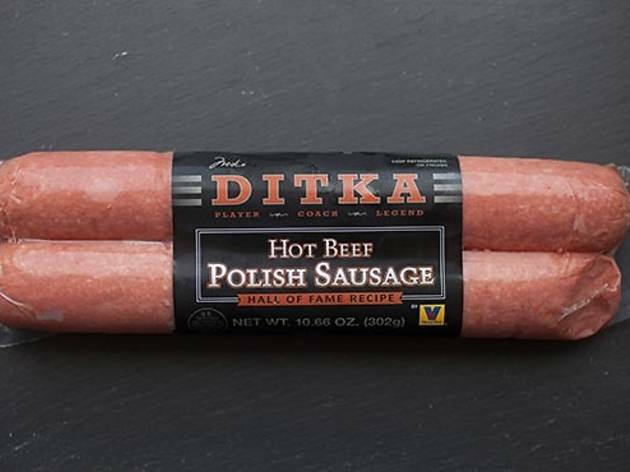 After striking out at the Cell and America's Dog and getting perplexed looks from the staff there, we began to wonder if Mike Ditka's sausage, which he made with Vienna Beef and released earlier this month, actually existed. So we made a last ditch visit to Jewel, where the amused deli counter worker directed us away from the sausage section and toward the cheese section, where the sausages were hidden underneath a pile of Lunchables. Alas, the Chicken Sausage with Tomato & Mozzarella was not available, so we just picked up the "Hot Beef Polish Sausage," which uses a "Hall of Fame Recipe" and is 1/3 of a pound and 8 inches long. So how does it taste? We heated them in the office, where we're sadly lacking a grill, so we settled for microwaving them. The package provides instructions for boiling, grilling/broiling or microwaving the sausages. Brent DiCrescenzo: I don't think microwaving was the best way to experience this sausage. Zach Long: Yeah, it doesn't look very appealing. Erin Delahanty: It's definitely greasy. BD: There's grease just sitting on the plate. Amy Cavanaugh: They're really pretty beefy, but there's nothing really special here. There's also a TON of pepper in these things. BD: Yeah, I just got hit in the back of the throat with the pepper. Laura Pearson: Can we not talk about the "mouthfeel"? ZL: There are little flecks in it. BD: Yeah, you can just see the red pepper in there. Jake Malooley: I want it on record that I'm a "superfan" of these. BD: Can we call them "meat stogies"? BD: I'm still tasting this in my mouth. JM: I just burped sausage.